Ancient Greek tradition blended esoteric and practical matters into the idea that the universe hinges on four basic principles: Fire, Earth, Water, and Air. To better grasp these principles, it is helpful to overcome our habit of using these terms solely as they relate to nature. Instead, we need to understand them in terms of their dynamic qualitative action. One way of identifying these formative forces is by way of capitalizing them; Earth as an Element takes on a different value than earth as soil. Richard Thornton Smith in his book Cosmos, Earth and Nutrition, the Biodynamic Approach to Agriculture, points out that Paracelsus (1493-1541) proposed the following; the quality of physical manifestation is associated with the Element of Earth; the Element of Water corresponds to the quality of life; while the Element of Air is associated with the quality of space; and the Fire Element corresponds with the quality of transformation. Earth: We begin with the rock and the earth which we meet outwardly with our senses. We meet this world of outer manifestation with the outer part of ourselves, our skin and our other sense organs. Water: Next we perceive the changes and flowing nature of the light, the sun, the time of day and year, of everything which grows and develops. We then move on to connect ourselves with the fluidity of the place in this process of time and space. Air: Here we connect with an inward process coloured by our likes and dislikes, our soul moods mixed with moods of whatever or whoever we meet. Perhaps there is a mental flash or perception about the true nature of this place, the genius loci. Fire: Hidden deep under all these layers lies the “essential being” of the plant, the place or the person – that understanding which we know intuitively in our hearts. This example of walking the land and using one’s outer and inner observational skills, including intuition, enables the farmer or gardener to gain a deeper and more profound understanding of their land, animals and plants. This inner knowing allows the person to make decisions based on clarity and insight. These four principles were referred to as primal forces by the Greeks and identified as solids (earth), liquids (water), gases (air/light), and an all-pervading, rarified principle, warmth (fire). Right up to the beginning of the Scientific Revolution in the mid-16th Century, the Elements were associated with phenomena that were observed “outwardly” as well as “inwardly.” Among other things, the qualitative dynamics associated with Fire, Water, Earth and Air were heat, dampness, cold and light respectively. Rudolf Steiner carried over this dynamic four-fold framework of perception into his approach to agriculture and anthroposophy. For Steiner, as indeed for many ancient cultures, the junctures between art and science, spiritual and physical, matter and spirit were seen as being much less clear-cut than that of conventional thinking. 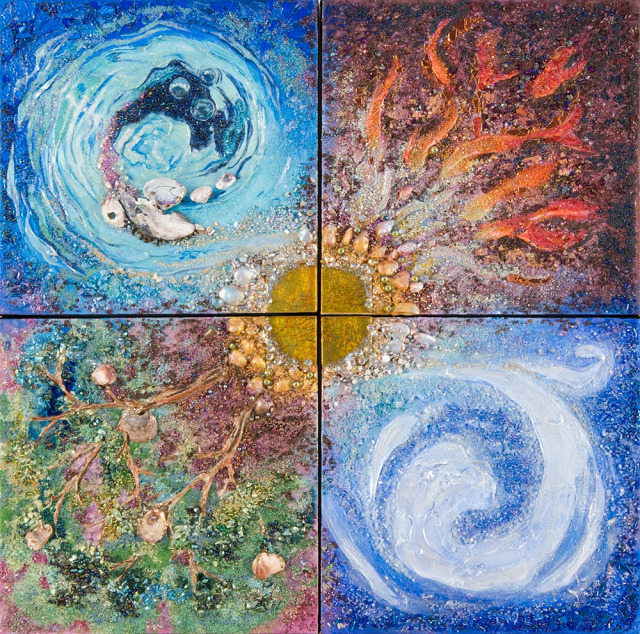 Steiner considered everything–each human being, plant, animal, and mineral–to be composed of combinations of these Four Elements. In a nutshell, Steiner’s formative forces correspond to the Greek archetypes: Earth being associated with everything solid; it brings form to all beings. The Water realm is the carrier of life and includes the etheric/spiritual component that lives even after the death of the physical being. The Air or Light realm is the space where insects and birds live and interact with flowers. The Fire realm contains the life code which is passed on to the next generation. Maria Thun (1922-2012) worked with Rudolf Steiner’s teachings about the Four Elements and researched the subtle changes of plant growth. She studied radishes and found that this root crop germinated with greater success when the seeds were planted on days when the Moon was in an Earth constellation. She concluded that there is a correlation between key parts of plants (root, leaf, flower, fruit/seed) and the four basic Elements (Earth, Water, Air/Light, Fire/Warmth) associated with the twelve Zodiac constellations. Let us next briefly explore these correlations and qualities. In relation to plant life, Earth is associated with nourishment from minerals. Roots play a key role in assimilating these substances. Steiner suggests that the quality of Earth and the mineral world are enhanced in winter due to incoming cosmic forces during the long nights. Earth as an Element is strong and stable. Each mineral is comprised of very specific and organized forces that create consistent qualities that nourish the basic life force in all plants and animals. As with all life, water plays a role in guiding plant development. The leaves have the greatest relationship to water, as they are the organizing, energy-producing components of the plant. Water has magnetic properties; it nurtures and sustains. It changes from its fluid phase into solid ice or vapour. There is an emotional quality associated with water that creates a feeling of placidity, meditativeness, and relaxation. While Earth is fixed and solid, Air is light and flowing. According to Steiner, Air is the domain of the animals, into whom has been blown the breath of life. This Element is thus closely associated with the breath of life and inspiration. Flowers by their nature inspire wisdom, creativity and self-development, all qualities associated with the Element of Air. The dynamic heat of Fire comes to plants through the Sun’s warming rays and in due time–most often the summer–brings forth flowers which lead to seeds and fruit. The Element of Fire has transformative and creative properties. The insects that fertilize the flowers carry within them the formative force of Fire. Georg W. Schmidt (1921-2005) took these teachings about the formative forces to a whole new level. In his document, Methods of Seed Regeneration, he compares the position of the Moon in the various constellations with the position of key planets and concludes that the Four Elements play a very key role in fostering yield, disease resistence, germination rate and nuturitional quality (see inside of back cover). Schmidt worked for many years on the development of methods for breeding seed material for cereal crops. His findings extend beyond these crops and are relevant for all seed saving applications. In this wider context, his work has lasting value as the importance of seed saving is becoming crucial during these times of climate changes, increased electromagnetic frequencies, and other sources of pollution. For a translation of Schmidt’s document, visit our website at www.planting-calendar.com. Reference: Thornton Smith, Richard, Cosmos, Earth and Nutrition, The Biodynamic Approach to Agriculture, 2009, Sophia Books, Hillside House, The Square, Forest Row, UK.